Rammstein are back, and we’re celebrating their 25th anniversary in the new issue of Metal Hammer – on sale now. 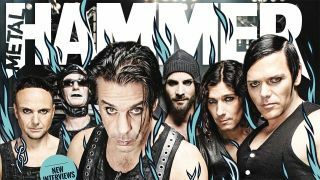 In the issue, we have over 25 pages of Rammstein, including brand new interviews with the band, their producer, collaborators, tourmates and many other people that have been on the frontlines for one of metal’s most insane stories. We go inside their early days, go behind the scenes of their infamous show, reveal the real Till Lindemann, dissect their most notorious songs and much, much more. But that's not all! The new issue also comes with free heavy metal fridge magnets, a free album art poster set and an exclusive free album from death gospel sensation Louise Lemòn. Also in the new issue, we team up Killswitch Engage and Parkway Drive for a special interview, bring you the story behind Megadeth’s classic Symphony Of Destruction, and introduce extreme metal’s most exciting new supergroup. Plus, we get Douglas Booth, star of new Motley Crue biopic The Dirt, to interview the real Nikki Sixx! All this and much more can be found inside the new issue of Metal Hammer – find your nearest store or buy online now.